Evening Loverlies! 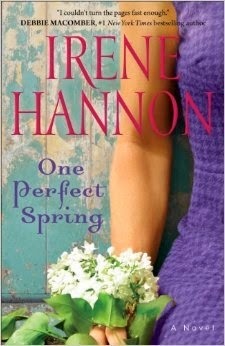 I have just finished reading One Perfect Spring written by Irene Hannon. This book is very sweet and has romance. To be honest I wouldn't say it was my favorite book to read, because the author wrote this book in about four different point of views. Every time I read a book in this writing style I always picture it as being portrayed better in a movie, I believe it would be easier to follow. I found the story lovely seeing how certain relationships played out. It seemed like perfect coincidences with God playing a role in their lives bringing them all together. I find it very neat when that seems to happen in real life. While reading I did find myself hoping for each relationship/scenario to turn out well. This book just shows how interesting it can be when God does intertwine certain lives together, and how it plays a role in the friends and family around them. If this book seems to peek your interest, then give it a chance! You can purchase this book on amazon here. Claire Summers is a determined, independent single mother who is doing her best to make lemonade out of the lemons life has handed her. Keith Watson is a results-oriented workaholic with no time for a social life. As the executive assistant to a local philanthropic businessman, he’s used to fielding requests for donations. But when a letter from Claire’s eleven-year-old daughter reaches his desk, everything changes. The girl isn’t asking for money, but for help finding the long-lost son of an elderly neighbor. As Keith digs reluctantly into this complicated assignment, he has no idea how intertwined his life and Claire’s will become–nor how one little girl’s kindhearted request will touch so many lives and reap so many blessings. Through compelling characters and surprising plot twists, Irene Hannon offers readers this tenderhearted story of family connections that demonstrates how life is like lilacs–the biggest blooms often come only after the harshest winters.